The only way to produce an accurate football simulation is to use play-by-play game data from the regular NFL season. We therefore compile all the official NFL play-by-play data produced by STAT’s Inc., which is available publicly at NFL.com. Each game's "Gamebook" contains most of the play-by-play information required to accurately design the NFL teams. DDF's proprietary software reads each play-by-play file and parses the information, categorizes it, and then adds the data to a database for analysis. At this point, every record in the database is reviewed to ensure accuracy. Then the real fun begins, with the NFL’s Game Pass on-demand service. That's right—we view video of every play of every game to verify the accuracy of the Gamebooks, record defensive alignments, and enter other information into our database. At approximately 120 plays from scrimmage per game—plus special teams plays—that's quite a lot of data over a 256-game season! Once all the regular season data is confirmed, a statistical analysis is performed to obtain all the data elements needed to create DDF's team charts for the current season. This analysis is performed using special database and analytic software to ensure that our statistical computations are correct. 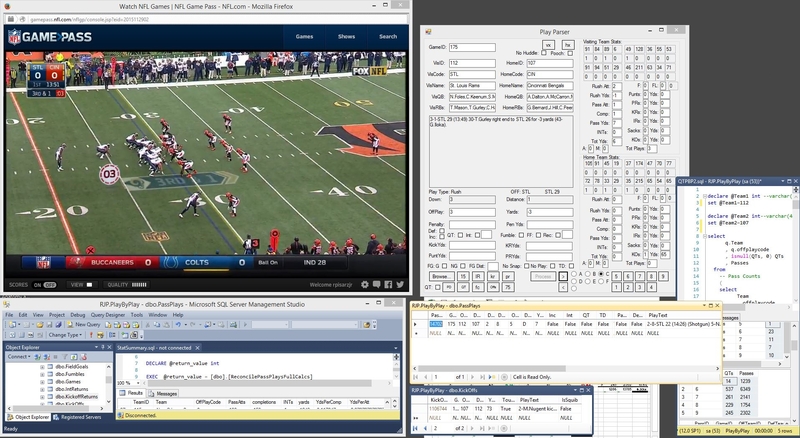 Additionally, during this phase the computed data elements are reconciled back to NFL.com's Gamebooks to ensure data integrity and accuracy. After the statistical analysis has been completed and all the data elements have been confirmed, the process of mapping play outcomes to team charts and assigning the appropriate probabilities begins. This procedure is equal parts automatic and manual, and includes a smidgen of artistry. Proprietary probability-mapping software is used to facilitate the process and ensure accuracy. We typically simulate a minimum of 100 seasons to ensure statistical accuracy, and also enlist playtesters to engage in head-to-head contests. This process provides powerful assurance that DDF remains the most realistic team-based football game available!